Modern footwear all too often looks great but causes pain and serious foot problems. But it’s not our fault, right? It’s the fault of the manufacturers. Well, those companies make money because we’re too vain to wear properly fitting shoes that may not look as pretty as those narrow pointy-toed stillettoes or narrow high-priced Italian loafers behind locked glass cages or on the store shelves. While gorgeous shoes can be a real extravagance and give us the selfish reinforcements we feel we deserve for being successful in life, they can also lead to serious health problems. In the event of designer shoes, beauty all too often equates pain. Once foot health is compromised, it’s tough to correct. Moreover, it can cause intense discomfort and reduce the overall quality of your life. Below we will try to answer the question: what is the best walking shoe available for men and women? Where To Buy / Shop ? Compared to those shiny shoes behind the glass, the cons just aren’t worth it for most people once they realize there are other options. Certainly, you wouldn’t consider walking for miles in your favorite designer loafers, but if work or life forces you on your feet, you need shoes that are up to the tasks ahead. So put those high priced baubles back on the shelf – at least for now – and focus on the best walking footwear. They may not be as pretty as the ones you’re drooling over, but they’ll keep your feet happy so you can continue to splurge every so often without having to use a walker. 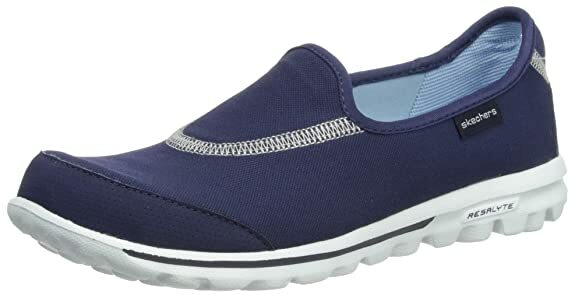 Great for plantar fasciitis and great walking shoe for flat feet! First of all, Clarks are amazing. But these aren’t true slip ons. They take some doing to get your foot into the shoe. A shoehorn helps. Now, with that said, once these are on your feet, they’re among the most comfortable shoes on the market. For the most part, they’re true to size. Try before buying if that’s a concern. They’re fashionable and available in 4 color/material choices – 1 leather, 3 nubuck options. A waterproof spray can ensure they stay fresh in all weather. The Ortholite footbed is removable, and the heel is shock absorbent. These are perfect for those with plantar fasciitis – either current or reocurring – and other foot concerns such as flat feet issues. They’re absolutely perfect for your walking needs. But if you’re concerned about size, consider going at least a half size up. Kay makes her entrance in brown or black full grain leather. These fun shoes offer a modern twist to a classic retro style. Dri-Lex lining and removable footbed provide continual comfort and moisture control for optimal foot health. These shoes are conversation starters as everyone will compliment your taste and wonder where you found them. They work with plenty of fashion needs, but they tend to run up to a size too big. These classic running-style shoes have a leather/synthetic upper material combination in 4 different fun color options and a man made sole. These lightweight eslking shoe incorporates rollerbar technology to provide proper lift and propel you further than similar shoes which are almost always more expensive. They have a larger toe box than many popular sneaker models today, but they can still feel a bit cramped for those with serious foot concerns. In most cases, however, they easily allow personal orthotics and fit well even with the footbed change. They’re absolutely perfect for those who experience pain in the middle or balls of the feet. Try before you buy to ensure these will work for your needs. It’s worth the extra step because they are good walking and training workout shoes. Great for fitness and exercise activities. Sketchers delivers the gold with their Go Walk slip on. Made of sturdy canvas and mesh, these shoes are so lightweight it barely feels as though you’re wearing anything at all. The Resalyte outsole is slip-free and super flexible. And the lifted rear pull adds security to the fit. There is gentle support, but some customers find it’s not enough for their arch needs. Adding your own orthotics may improve that. Also, while not waterproof on their own, a simple spritz of waterproof spray can easily correct that and let you walk yourself into a tizzy in the wettest weather. 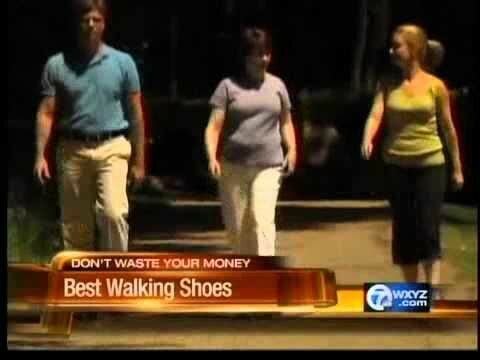 These shoes are so great for walking, that chances are the shoes’ soles will give out before you do. They are compact, so you can easily use if for travel. Don’t let the name fool you. Mya is much more than a work shoe. These plush walkers are available in black or white to adapt to personal or professional needs. While not necessarily the most fashion forward option, they are great for hiking. Easy maintenance is a given since they’re machine washable. The comfy gel insert is removable to permit your own orthotics or allow you to go without. Stretch gore permits a secure fit. While the shock absorbing heel, slip resistant outsole, and padded collar keep you on your feet regardless of surface changes. PF and flat feet favorite! The classic sneaker-style shoes are available in white or black for practically any casual fashion need. They’re made of synthetic material and mesh, so cleanup is a breeze. This also keeps them waterproof. The thickly threaded rubber sole provides stability and absorbs shock. Double layers of memory foam line the heel and collar, while the forefoot is aided by gel cushioning. You could add your own orthotics, but why would you want to? With forefoot and heel support, this shoe is among the very best for plantar fasciitis and other serious foot health concerns. Midfoot and arch support are also extremely beneficial for aiding those with flat feet or fallen arches. The only concern is that this model tends to run small. It accepts wider widths, but it can be shorter than expected. Ordering a half to whole size higher than your norm often takes care of the problem. Propet is quickly becoming one of the top companies for producing walking footwear, and many customers agree. 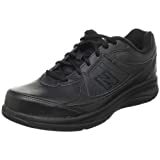 The Commuterlite is among the most comfortable and generally best walking shoe and work shoe on the market as of 2015. In brown or black leather, this casual dress shoe fits an array of fashion needs and can be dressed up or down, depending on need. A rubber 1 1/2 inch heel and outsole eliminate shock and aid in traction for any surface. Moisture is wicked away from the skin with the Nylex lining. This shoe is true to size and caters to larger width needs. 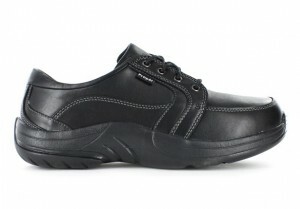 Medicare in United States endorses this as a diabetic–friendly shoe. Popular for Europe as well. It’s also extremely good for plantar fasciitis and other foot concerns such as flat feet. 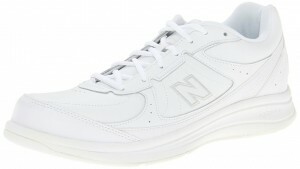 This New Balance model offers unique looking and really comfy sneeker. They’re offered in 3 leather color options, and light grey suede. So this shoe can easily work with a number of fashion needs. The thick rubber strike-path outsole offers roller bar technology which helps with stabilization. Traction effortlessly grips all surfaces while aiding in security. The “abzorb” midsole provides plenty of comfort and reduces shock. Your orthotics can easily be added or left behind. 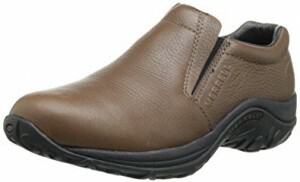 This model also offers a Phantom Liner which absorbs common foot odor from walking all day. These are Medicare endorsed diabetic-friendly sneaker, but you’re the only one who needs to know. 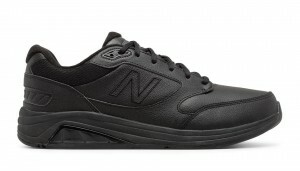 New Balance make really good walking shoes for everyone’s needs. This basic New Balance shoes offers a few bells and whistles with a simple design. Available in black or white, it can easily fit into work or play. The upper material is synthetic, which allows for easy cleanup and water resistance. Padded collar and tongue, as well as NB’s patented “abzorb” cushioning make hiking a breeze. The foot-bed is created with walkers in mind and the outsole contains Strike Path technology for extra shock absorption. 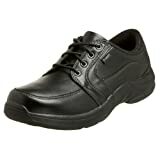 This shoe is especially good for those who have to walk or work on hard surfaces. It is among best men’s walking sneakers available. These Merrell slip-on’s step up to the plate and knock the ball right out of the park every time. Available in 16 – yes 16 – color options, these shoes become an instant favorite for any fashion style or activity you can imagine – from work and dating, to a hike in the woods or just meeting the guys for wings. They’re made of real leather – most color options are suede – so they’re not waterproof on their own. A simple spray down will help with that, though. The GRIP sole ensures you’ll stay on your feet regardless of what you step in. Sweat absorbing liner keeps odor at bay. While the air cushioned shock absorbing sole and compression molded foot bed help you feel as though you’re continuously walking on air. 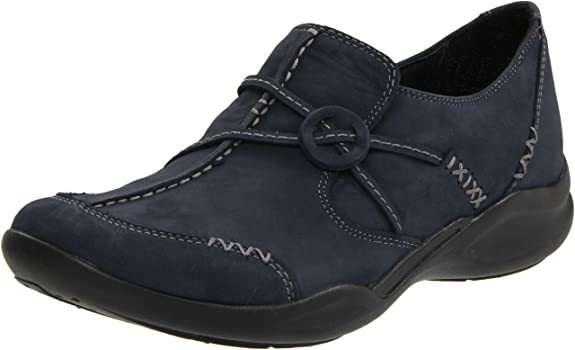 This top shoe for walking fits it’s true to size, works for wide widths, and helps with just about any foot concern imaginable. It’s truly a great shoe.